Elizabeth Zimmermann's Baby Surprise Jacket (BSJ) has settled comfortably into the pantheon of classic hand-knitting patterns. Elizabeth's grandson, Cully, has juggled the construction and sizing to provide instructions for an Adult, a Baby and a Child's size Surprise Jacket. This leaflet (12 pages) includes Elizabeth's original directions from 1968 as well as colour images and more detailed instructions. Regia pattern for knee-high ribbed socks in sizes from child - adult.. The pattern includes illustrated instructions for the short-row heel and toe shaping. A wide range of patterns for babies, children and adults - all suitable for 4ply sock yarn. 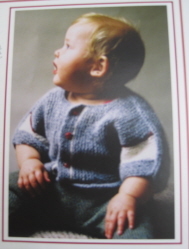 Knitting patterns from King Cole suitable for DK and aran. These sock patterns, designed by cookie a, are suitable for more experienced knitters. The patterns require a lot of concentration but the results are stunning and well worth the effort.